About Dog Wool - Knit Your Dog! At Knit Your Dog, we turn your dog’s hair into clothing, accessories, and gifts. Shed happens, and it’s actually a beautiful thing! Knitting dog hair is nothing new, believe it or not! The official term for wool spun from dog hair is chiengora. Not all dogs’ hair can be spun pure; many breeds’ hair must be mixed with more conventional fibers such as sheep, alpaca, or others. The best hair for wool is the undercoat of a longer-haired, rough-coated dog, such as Chow Chow, Golden Retriever, Samoyed, Newfoundland or other such breed. Guard hairs (the waterproof, outer part of the coat) do not spin. Because dog hair is not the same as sheep, goat or alpaca, it does not spin in the same way. Dog hair that has been clipped generally cannot be spun. Only dog hair that has been harvested by brushing can be spun into wool. In order for it to spin, the entire hair shaft is needed. With few exceptions, if the hair is cut, it cannot be spun. And if it can be spun, there is a scratchy texture to the wool from the clipped ends. How do I get wool from my dog’s hair? 1. The hair must be harvested from your dog. Do not use a Furminator or shedding blade. Complete harvesting instructions are right here. It’s really easy. 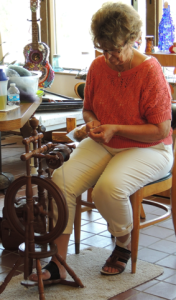 Linda spins on a Colonial Era replica wheel. 2. The hair will need to be washed to remove dirt and dog smell. The overall weight of the hair will decrease as the dirt is removed (and the volume increases exponentially). 3. Once the hair is washed and fully dry, it is then carded. This process aligns the fibers so that they will spin properly. 4. If the hair can be spun on its own, it will not need to be blended with other fiber. 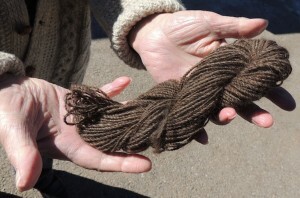 Otherwise, it will be matched to a conventional fiber and blended to make it long and stable enough to spin. 5. The wool is spun and wound into skeins. Questions? Comments? Click on “Contact Us” on the side of the page!